Day 4 of our program started off with a very early start, continuing from where we left on at the end of Day 3. We went to the nearby Tokachigaoka Park from Kangetsuen, for our hot air balloon adventure, operated by Tokachi Nature Centre! 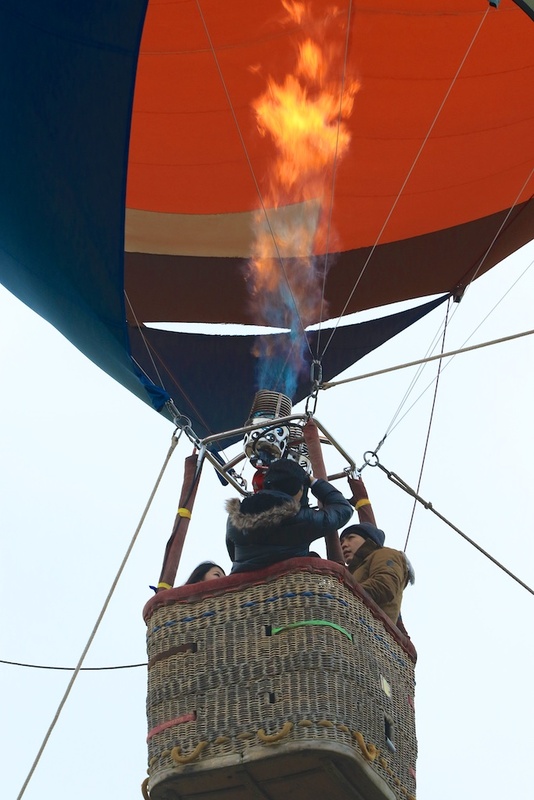 The hot air balloon ride is dependent on the weather conditions and for that morning, it was clear for our hot air balloon adventure! It was very interesting to see how they do the setup for the hot air balloon and we were busy clicking away on our cameras! Another first time for me, taking a hot air balloon ride! 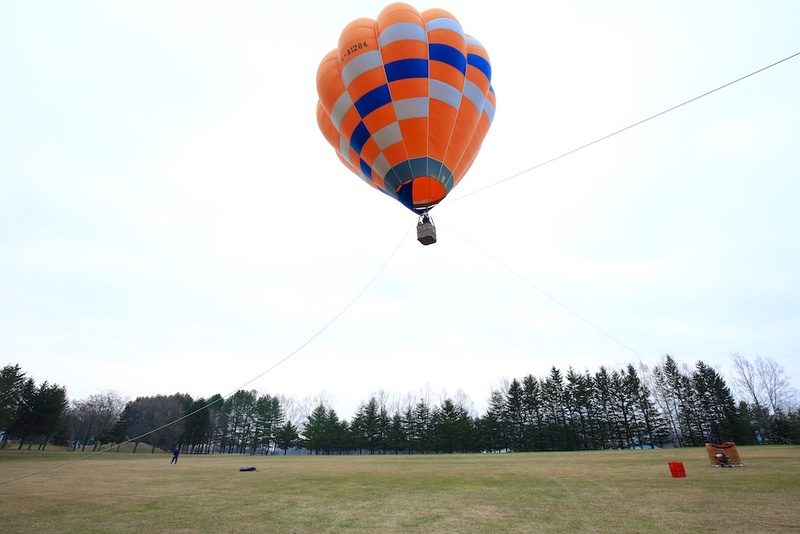 Once the hot air balloon ride was ready for boarding, we split into two groups to go up the hot air balloon ride. While one group was in the air, we took photographs of them from the ground up and vice versa, we helped each other to take photographs when we either up in the air or on the ground! When we were up in the air on the hot air balloon, the weather wasn’t that clear due to the misty autumn/winter weather conditions. Up in the air, while we had a bird’s eye view of the Tokachi area, the cold autumn/winter wind was upon our face and it was quite difficult to face the direction where the cold chilly winds was blowing from! After our hot air balloon ride, we returned back to our hotel Kangetsuen for breakfast and checked out from the hotel. 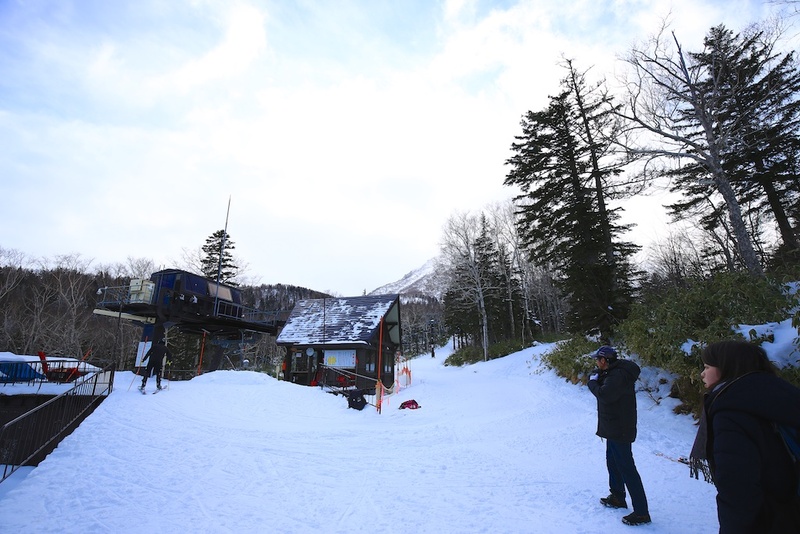 Our travel schedule on the fourth day was to go up the mountain range in Central Hokkaido. It was a bit of a long traveling journey on the road, however, we were blessed with many awesome and gorgeous clear deep blue skies and landscapes! The Sounkyo area is a real gem in Hokkaido’s tourism and I love this place! If there are hidden gems in landscape photography around the world, they have to visit Sounkyo! 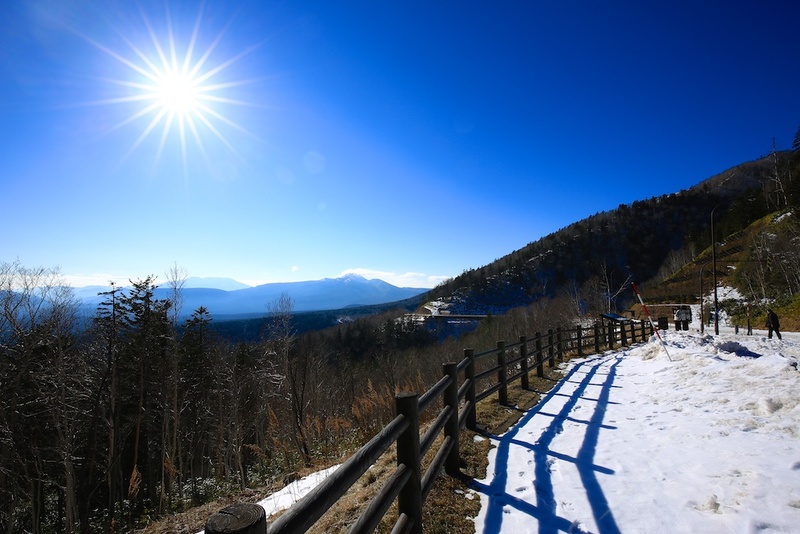 While traveling uphill from one area to another area, we were entering from autumn season into winter season! 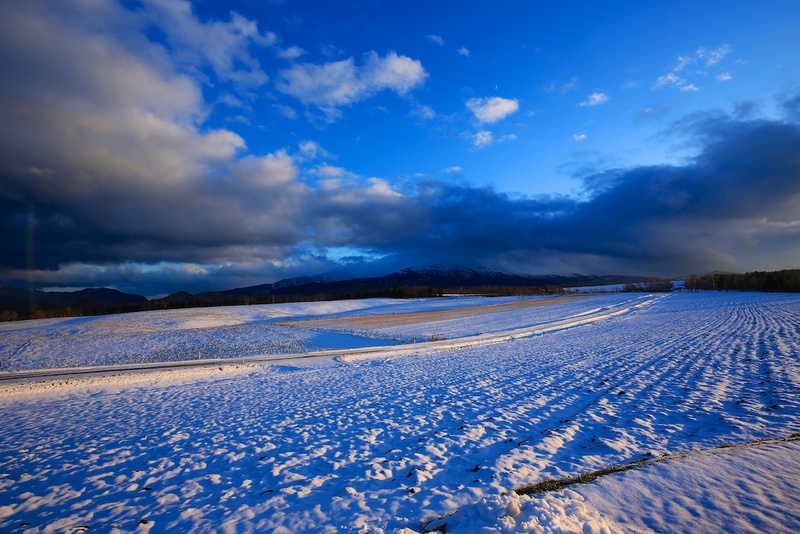 Such is the natural and wonderful beauty of Hokkaido four seasons! I was amazed and went into landscape photography heaven, so beautiful and words can’t do enough justice to the natural landscape beauty of Hokkaido. I really hope that my landscape photographs that I am sharing will tell the whole world about the hidden natural landscape beauty and gems of Hokkaido! Stopping by Mikuni Touge Pass, there was a rest point and lookout point. We had a pit stop and we were blown away, our eyes and camera glued to the clear deep blue skyline and the mountain range. It’s so beautiful! We continued our road trip, surrounded by snow and the mountain range, arriving at our hotel, Sounkyo Kankou Hotel (Sounkyo Onsen). Firstly, we dropped off our luggage and had lunch at Sounkyo Kankou Hotel. During our lunch, Mr. Nakajima-san of Sounkyo Tourist Association was there to visit us and host us for the afternoon! We were also very honoured and happy that a Master Landscape Photographer, Mr. Koetsu Ichinetsu Sensei will be hosting us and showing us around various locations in the Sounkyo area! Mr. Ichinetsu Sensei showed us his collection of landscape photography works and they were so amazing, so beautiful, a highly experienced Master Landscape Photographer, the Best of the Best Landscape Photographers. The expectations were building up towards our next destination, Mt Kuro-dake, towering 1,984m in height, in the Sounkyo region. We were so amazed and blown away by the beauty of our surroundings and landscapes. After our wonderful lunch at Sounkyo Kankou Hotel, we eagerly traveled to the base of Mt. Kuro-dake, for our ropeway ride up to the middle of Mt. Kuro-dake, part of Daisetsuzan National Park. While waiting for turn to board, Mr. Ichinetsu Sensei brought us to a rest area at the base station and we were treated to some of his awesome and breathe-taking Hokkaido landscapes photographs printed and on display! Mr. Ichinetsu Sensei is truly a Master of Master Landscape Photographers! Soon, it was time to board for the ropeway journey up the mountain! The photographers soon glued themselves to the glass panel, eagerly waiting to see what the landscapes would be like and getting our cameras ready for action! As the journey up Mt. 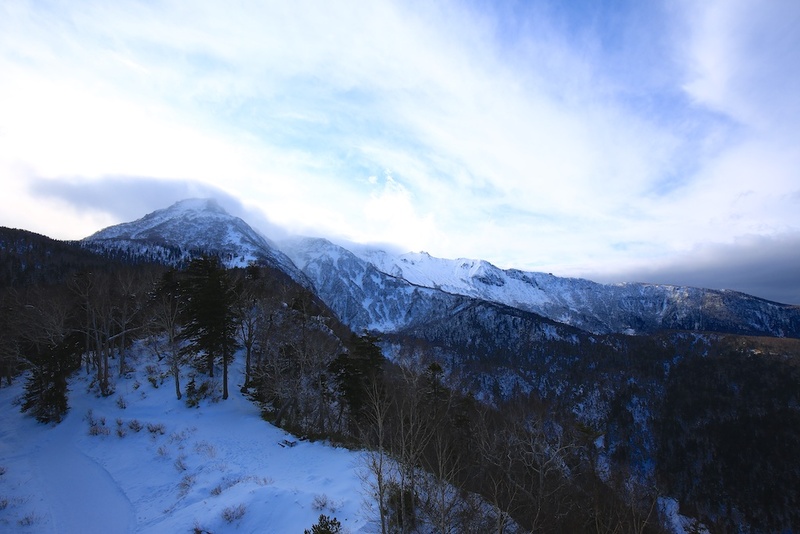 Kuro-dake began, I was blown away again by the charm, aura and beauty of the landscapes of Mt. Kuro-dake and her surroundings. It is so grand, beautiful and magnificent and I am running out of words to describe them! I started to visualize how it would be like during Autumn season while taking the ropeway up to Mt. Kuro-dake and I make a promise that I MUST return to Hokkaido during the Autumn season to photograph the bright colours and beauty of Sounkyo. Upon reaching the mid way point station of Mt. Kuro-dake, we disembarked from the cabin and walked up to the rooftop of the station. We had a bird’s eye view from Mt. Kuro-dake of the landscapes and mountain range of Sounkyo. Our cameras went into crazy action mode, capturing as many different frames, angles and perspectives. It’s a dream come true for landscape/travel photographers to record and share the beauty and charm of Sounkyo. 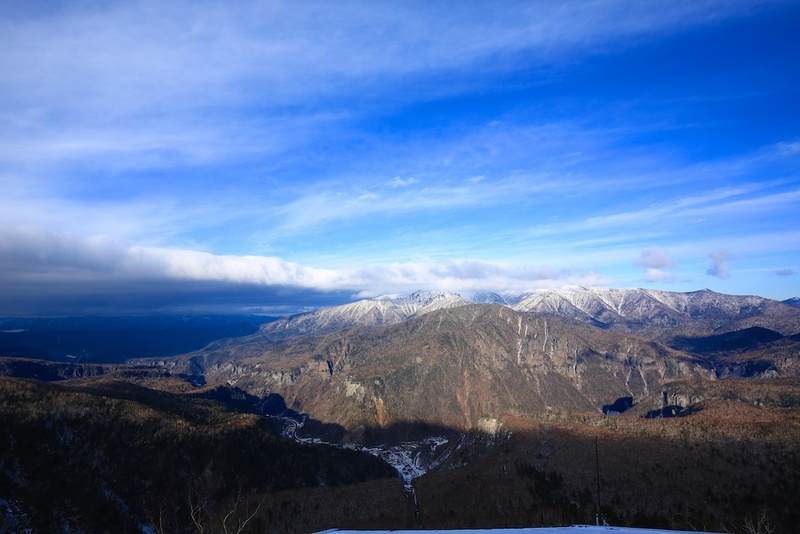 After taking many photographs at the rooftop, we went down and started trekking a short distance to watch people skiing and snowboarding at Mt. Kuro-dake. We had fun too, taking photographs and playing with snow! Due to time and schedule constraints, we could not explore uphill further. We began our descent down Mt. Kuro-dake, enjoying our last few minutes’ view of the landscapes and surroundings. 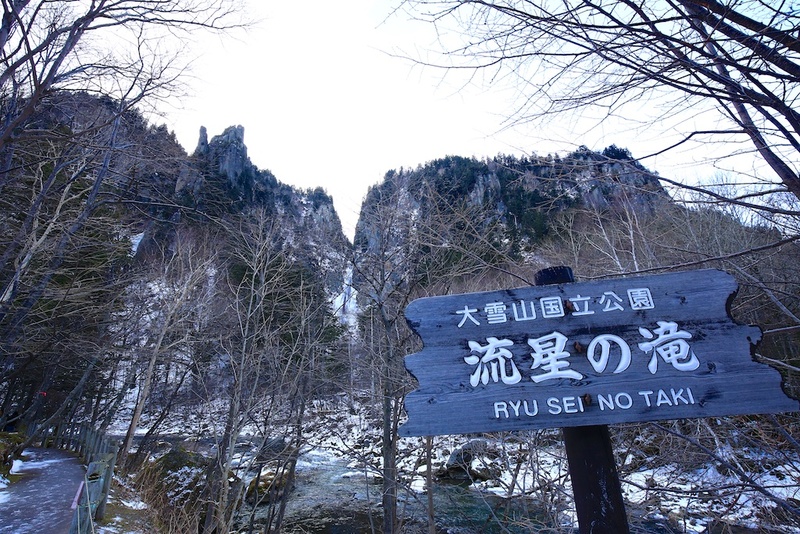 Next, we were heading to two famous waterfalls in the Kamikawa region, they are the Waterfall of Meteor （流星の滝）/ Waterfall of Ginga　（銀河の滝）. 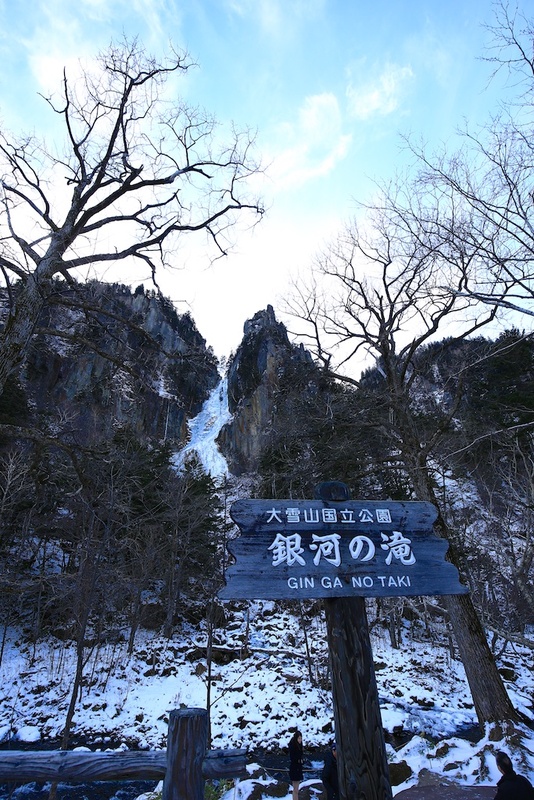 The Waterfall of Meteor is the female waterfall at 120m in height while the Waterfall of Ginga is the male waterfall at 80m in height. Both the waterfalls were close to fully frozen and it was a very interesting landscape sight. I am sure both waterfalls will be really beautiful during summer season! Mr. Ichinetsu Sensei was very kind and helpful, sharing his vast local knowledge experience, photography experience and expertise with us, the band of photographers. He was showing us where to stand and how to compose/capture various views and perspectives of the two waterfalls! It was a very humbling experience (especially for me) when Mr. Ichinetsu used our cameras to shoot in order for us to learn and have a better perspective on how to compose landscape photography in Hokkaido! Mr. Ichinetsu Sensei style of mentoring/sharing his hands-on photography experience strikes a deep chord with me on how I should and can adopt to mentor/share my photography experiences with my photographer friends and my student/disciple under my care! After our photography adventure at the two waterfalls, we returned to our limousine mini bus and traveled towards our last official photography destination of the Hokkaido Photographers Invitation Program. This magnificent destination, the Daisetsu-Asahigaoka, is where I got some of my most memorable (and probably my best) landscape photographs of the whole travel adventure. 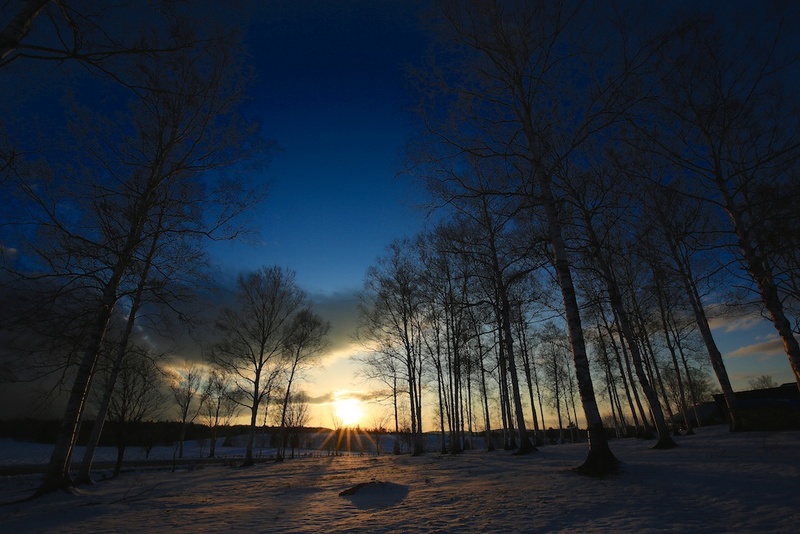 The vast land, covered with snow on the fields, the white clouds moving in the background and the sunset rays shining through the horizon. It was like in heaven and indeed it was due to the altitude of the area. I am now in a winter dreamland, a paradise on Earth. I always have a soft spot for traveling to Japan and Hokkaido really took my heart, mind and soul and planted it there. I really wanted to continue photographing many of the beautiful and magnificent landscapes in the Kamikawa and Sounkyo regions. 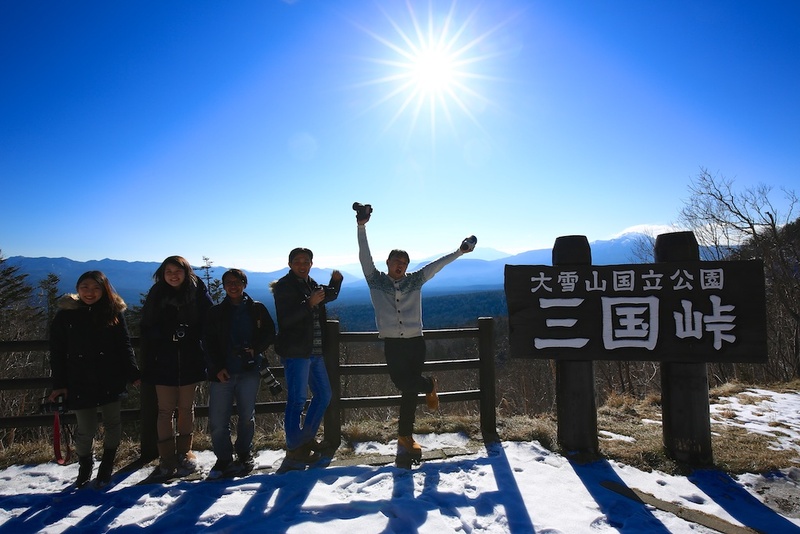 While we were immersing ourselves into the Daisetsu-Asahigaoka gorgeous and magnificent landscape, Mr. Ichinetsu Sensei was just as enthusiastic and energetic as us! Mr. Ichinetsu Sensei was leading us to various spots around there and sharing with us tips, angles, perspectives, composing and framing the landscape photography shots! The Landscape Photography Master was walking pretty fast on the snow covered ground, leading us to various spots and we had a fun time chasing after him, rather awkwardly because we were not used to running on snow covered grounds! We ran and we left our footprints, our hearts, mind and soul at the Daisetsu-Asahigaoka（大雪高原旭が丘). As the Hokkaido sun sets over the Daisetsu-Asahigaoka horizon, we packed our gears and waved goodbye. This was the last official photography destination on the Hokkaido Photographers Invitation Program and we left with heavy hearts for she stole our photography hearts! It was an omen that Daisetsu-Asahigaoka was sending out to us, the band of photographers that we had to return one day, we must return one day! On our way back to our hotel, we had a stop at the Ice Pavilion and had some fun inside there! 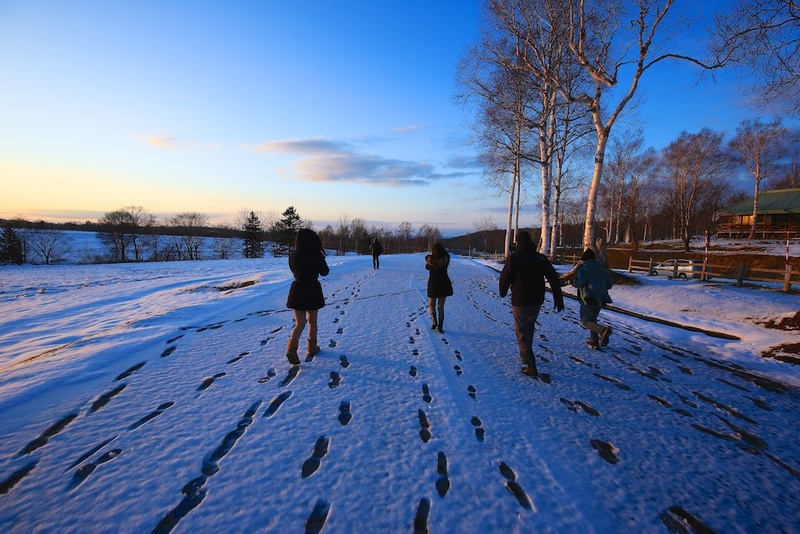 We were treated to a temperature of -41 degrees Celsius, the lowest temperature ever recorded in Hokkaido! We also had a chance to play on the ice/snow playground that they created! There was so much fun sliding down the ice slope/slide! Do check out their website for more information and details! Returning back to our hotel, we rested and changed to the yukata, getting ready for our dinner. The hotel owner, Mr. Morita Shigenori, General Manager, Mdm. Chida Tamami and Chief of Reserved Seat Mr. Yasuhito Toda, hosted us to a grand and sumptuous Japanese Kaiseki Dinner. We were touched by the warm Japanese hospitality and we learned so much more about Japanese traditions and cuisines! 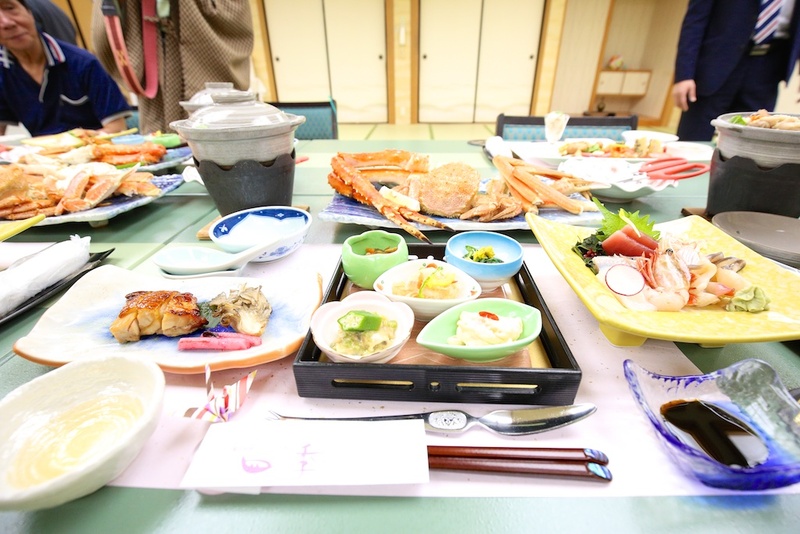 One of Hokkaido’s most iconic dishes is their snow crab. This was my maiden experience eating a Hokkaido snow crab in my lifetime till date and I confessed that I don’t know how to cut open and eat it properly. I was struggling and a bit lost, Dennis helped me out by telling me how to cut it and dip in the sauce. I must be a slow learner in eating crabs and Mdm. Chida Tamami saw that I was lost in the world of Hokkaido crabs. Mdm. Chida Tamami decided to take good care of me and showed me how to cut open the snow crab and how to eat it properly, with translation help from Moe-san, sat beside me. Mdm. 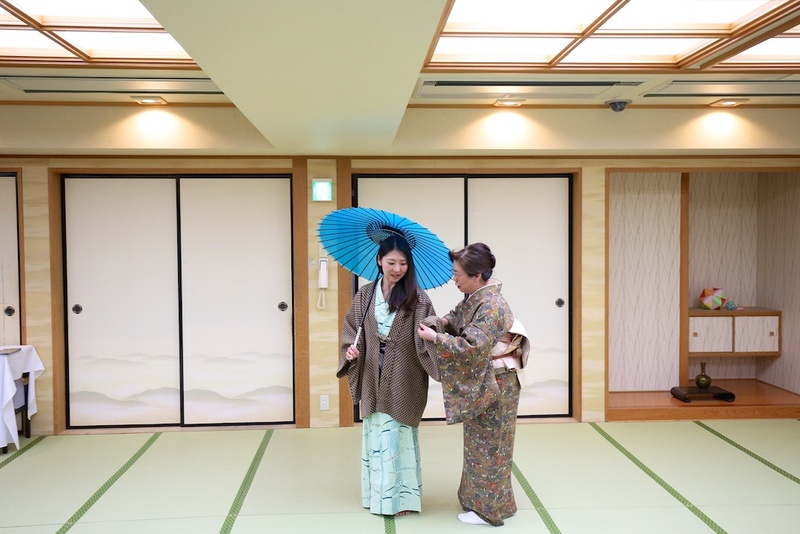 Chida Tamami was such a great host with heartwarming Japanese hospitality! It was a lively and fun dinner, accompanied by the sumptuous Japanese cuisines. Mr. Ichinetsu Sensei was sharing with us his photography equipment and experiences; we were amazed by his vintage Linhoff film camera. Being a photography buff and film SLR user many years ago, I could not resist asking Mr. Ichinetsu for permission to touch and feel his Linhoff film camera! It was a priceless nostalgic photography experience! Mr. Ichinetsu Sensei was also sharing with us about his thoughts when he was the group during the afternoon; we were very humbled and honoured by his warmth, hospitality, and enthusiasm. That was something about Mr. Ichinetsu Sensei that got me even more in awe of this Master Landscape Photographer; he is 75 years old and still going strong! 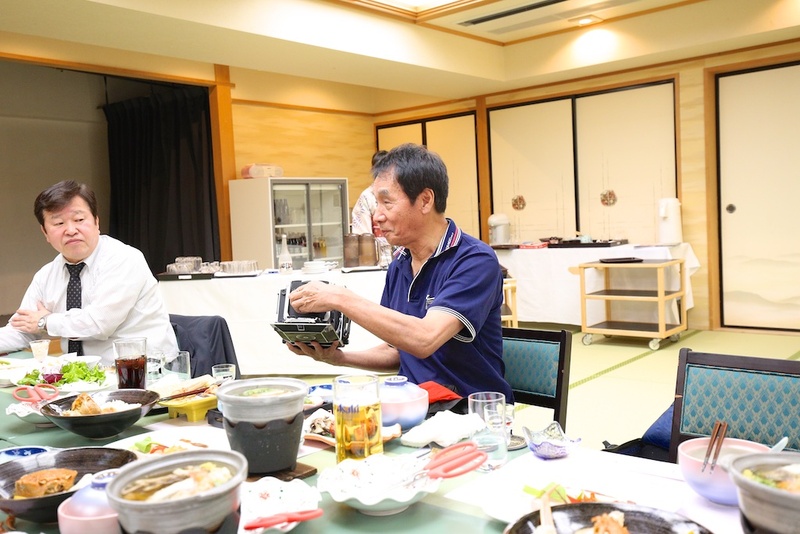 During the dinner, Mr. Morita Shigenori shared with us that Sounkyo Kankou Hotel is expanding their outdoor onsen and it is scheduled to open in Fall 2015, around end of August 2015! I am excited and hope to be able to enjoy at their outdoor onsen when it opens in Fall 2015! It kind of fits nicely to my plan (hopefully it can come true!) to visit Hokkaido during autumn in mid October 2015 and Sounkyo/Kamikawa (and visit the new outdoor Sounkyo Onsen) are inside my travel schedule agenda! All good things must come to an end; Mr. Ichinetsu Sensei had to leave early from the dinner because he had to prepare for another visit the following morning. Mr. Ichinetsu Sensei shook hands and hug with each of us before making his leave. A true master photographer that commands so much respect among the community and his humility, priceless and a great example to learn and follow. I had a light-hearted moment with Mr. Ichinetsu Sensei when he touched my belly in a friendly way (yes, I had too much good food in Hokkaido). I promised myself to slim down my tummy before I return to Hokkaido in the near future! After our dinner ended, we the band of photographers decided to head out and check out Sounkyo night sky and go for night photography/star trail photography. We walked to the ropeway base station of Mt. Kuro-dake and spent some time there photographing the night landscapes and star trails. While our works couldn’t match up to the ones we managed to capture at Lake Akan on our second night in Hokkaido, all of us had a fun time to bond and take photographs together for one final night together in Hokkaido. Upon returning back to Sounkyo Kankou Hotel, we sat together and rested with hot beverages from the drinks vending machine in the hotel lobby. The hot beverages warmed us up from the cold chilly Hokkaido winter night. We, this particular band of photographers, were able to bond very well, having pretty good chemistry and teamwork during the whole Hokkaido Photographers Invitation Program. I am very happy to be traveling and photographing with them for this whole program. After a while, we went back to our rooms and headed to the onsen, to enjoy and relax from an exciting Day 4 of the Hokkaido Photographer Invitation Program. As I sat and relax inside the onsen, reflecting back on my Hokkaido trip, it was very amazing and it wasn’t a dream, I am in Hokkaido and I managed to photograph and share some of Hokkaido’s finest beauty in the Central and Eastern regions. Personally, I felt that I got my best landscape shot of my Hokkaido Photographer Invitation Program on Day 4 here in Kamikawa/Sounkyo region. An amazing day and a great finale to mark the end of Day 4 in Hokkaido! Now I will let my photographs do the talking instead.